With 4K LCD monitors from the likes of ASUS, Sharp, Dell + others becoming common this guide details how to use these displays as a MOSIAC +1. MOSAIC is a Quadro Technology used to combine multiple display outputs into a single seamless Desktop. MOSAIC layout is setup as a GRID described in terms of rows and columns. 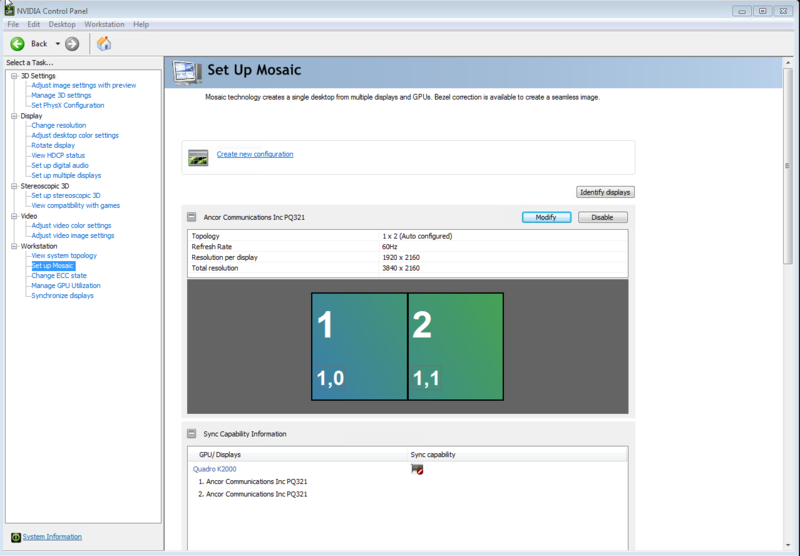 Using the NVIDIA control panel you can configure a single MOSAIC GRID. 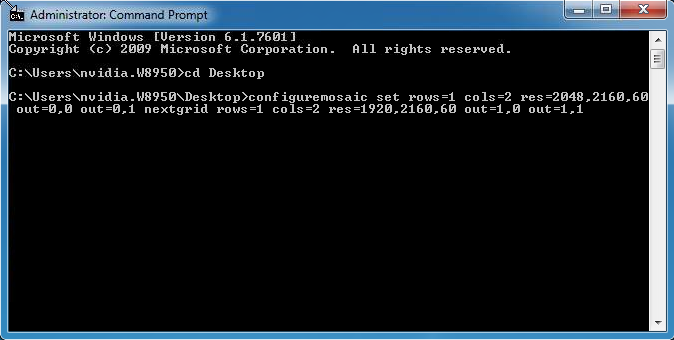 If you want to configure multiple display GRIDS you can do so via configuremoasic command line tool. +1 refers to having a control display connected to a larger MOSAIC wall. The control display is primarily used to aid in the setup of the wall and applications. It is not intended as a clone of the main display wall. What is UHD MST monitor? UHD refers to ultra high definition which supports 3840x2160@60Hz. These monitors are commonly referred to as 4K. MST means the monitor is making use of Display Port multi-streaming technology. In this case a single DP cable carries the two 1920x2160@60Hz display signals - left and right half of the monitor. 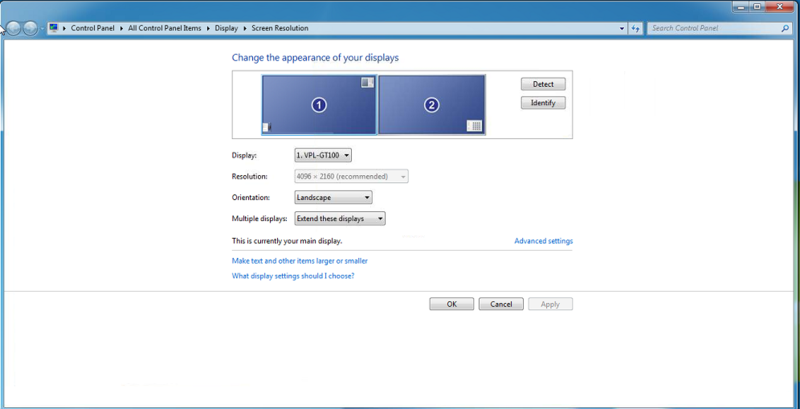 When the NVIDIA driver detects this type of display it automatically enables MOSAIC so the user see a single 3840x2160@60Hz monitor. With a NVIDIA Quadro card you can check if your monitor is using MST by going to the Setup MOSAIC page of the nvidia control panel (see below). The display will show as Auto Configured. NV control panel showing a ASUS PQ321 UHD monitor attached to K2000. 1. Quadro K2000 - ASUS PQ321 monitor attached. 2. Quadro K6000 - Sony GT100 projector. The projector uses two DP1.1 connections (2048x2160@60Hz) from the K6000. 2. Download and save configuremosaic (if not already on your system). 3. Use the NVIDIA control panel to identify which displays are connected to which GPUs. Go to Set MOSAIC page and select Identify Displays. In this OSD (On screen Display) shows 1 + 2 on the projector and 3 + 4 on the LCD monitor. Note the smaller pair of numbers - i.e. 0,0, 0,1, 1,0 1,1. The first number of each pair identifies the GPU. The second identifies the port number. 4. Open a command shell with Admin privileges and go to the directory where you saved configuremosaic tool. In Windows7 - type "cmd" into search - it should find the cmd.exe Program. Right click and select "Run as administrator". 5. Enter the configuremosaic command with the following options. set - set the following grid. rows=1 cols=2 - describes the grid. res=2048,2160,60 - this is the resolution of the Sony projector. out=0,0 out=0,0 - this is the display order out. In this grid there are two displays - hence to outs. The number pair refers to the OSD you noted earlier. nextgrid - we are specifying two grids. nextgrid is used so we can describe the 2nd grid. This contains most of the same parameters. 6. Hit enter - It may take between 30 to 60s for the layout to be applied. During this time the displays will likely flash.